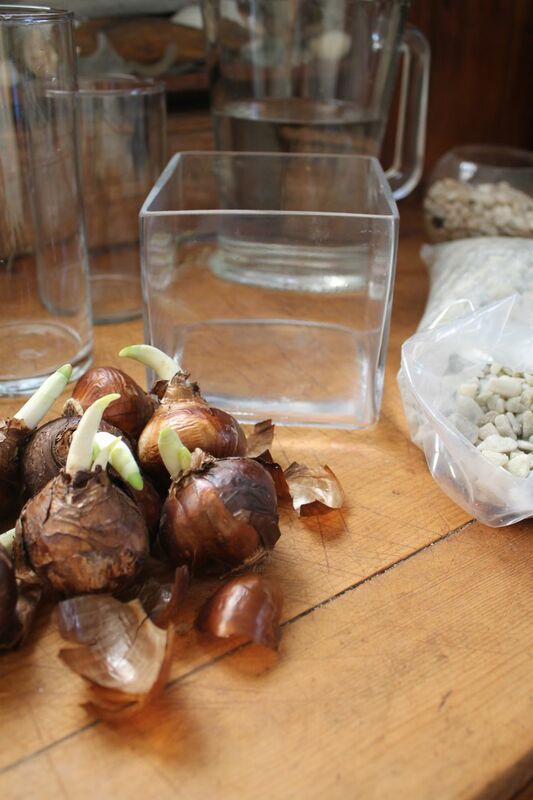 The bulbs (about .80 each), a small vase (think individual bud vase), small stones/rocks (5 lb. bag white rocks $2.99) and water. The stones can be rinsed and re-used for years – I’ve been rinsing and re-using mine for about four years. 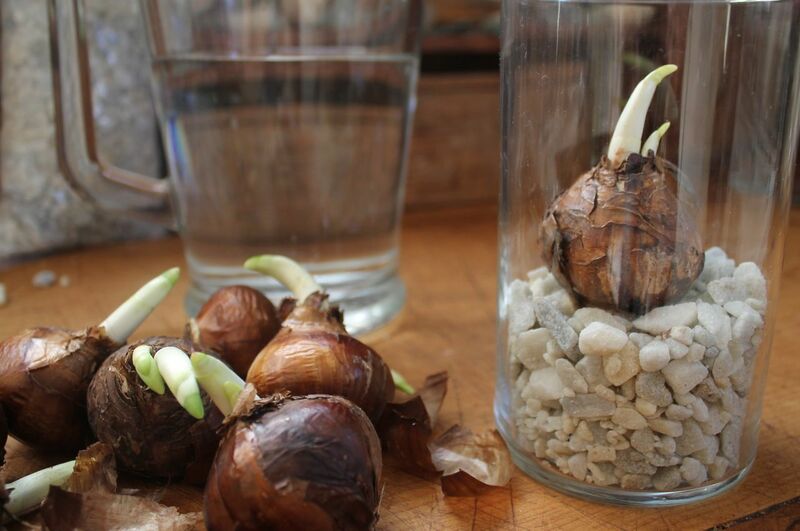 The water and the bulb will need to be discarded or composted once the flowers have past. It’s done in 4 easy steps. Pour rocks, place bulb, pour a few more rocks, pour water. It’s that simple, really. If using new stones, rinse stones first. Place about 1-2″ of stones in vase – amount is dependent upon height of vase. This flower tends to flop over, so the taller and narrower the vase, the better (you can always stake and tie the stem if using a more stout vase). Place bulb, root side down on top of rocks. 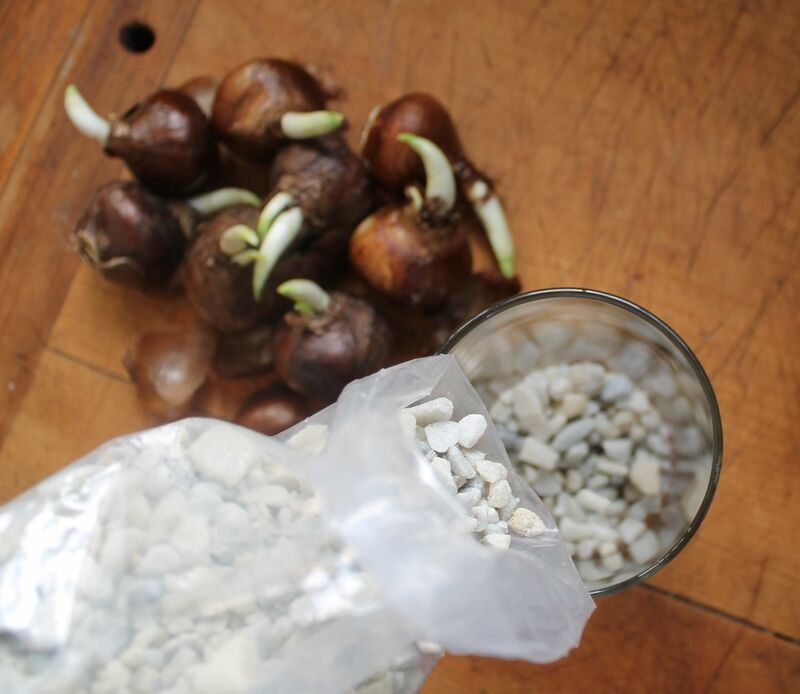 Pour a small amount of stones over the top and sides of bulb, not completely covering bulb, but enough to help weigh it down (again, it’s a top heavy plant, so once roots start shooting downwards and the stem upwards, the stones will aid its’ ability to stand upright). If the vase is quite tall and slender, less rocks are needed on top, if any. (I always like to use a small amount of stones on top, simply to help keep the bulb in place, regardless of vase style). Then add enough water to cover/reach the root base. It’s that simple. Be sure to place in area where it will receive indirect sunlight and can enjoy cooler temperatures (60-65 F ) and that’s it – really. Maintain water level and only add when it falls beneath the root line (careful not to overfill as rot may set in), check it about once a week…then watch it grow. 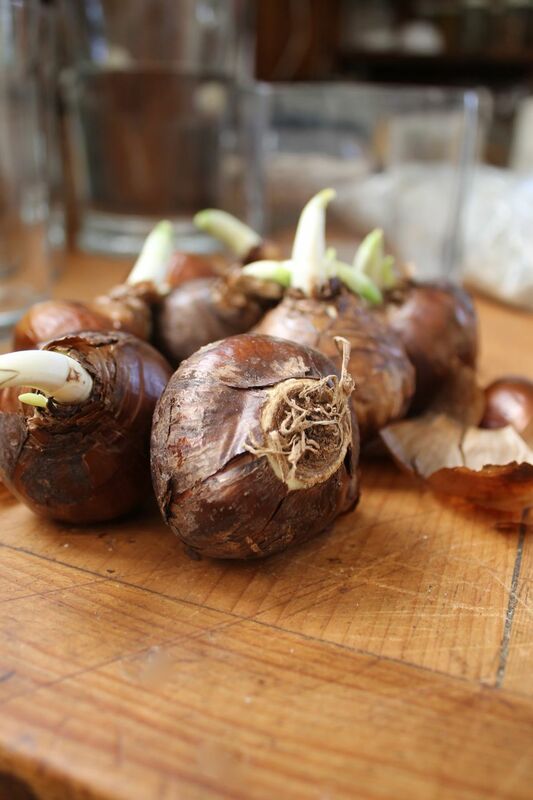 The best part of forcing bulbs indoors is that you can plant subsequent plantings and have fresh flowers all winter long – regardless of your hemisphere! 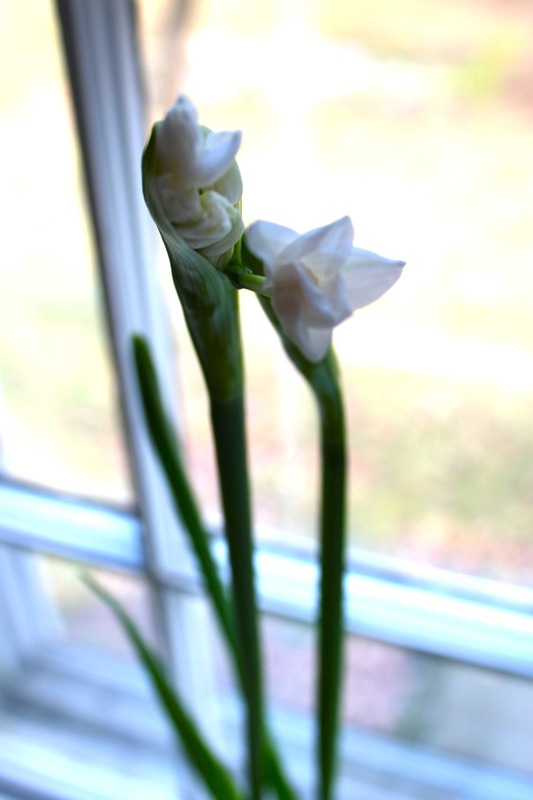 Narcissus typically flower at around 4-6 weeks after planting (depending on conditions), so if you plant every 3 weeks your guaranteed to have sweet scents week after week – even throughout the doldrums of a dark, cold New England winter….The other practical side to plating paperwhites during the winter is that they like cooler temps and indirect sunlight – which is great news for those of us in New England as it is cold and sunshine is fleeting…love this idea below too. Incredibly scented flowers atop slender bright green stems what’s not beautiful about that? 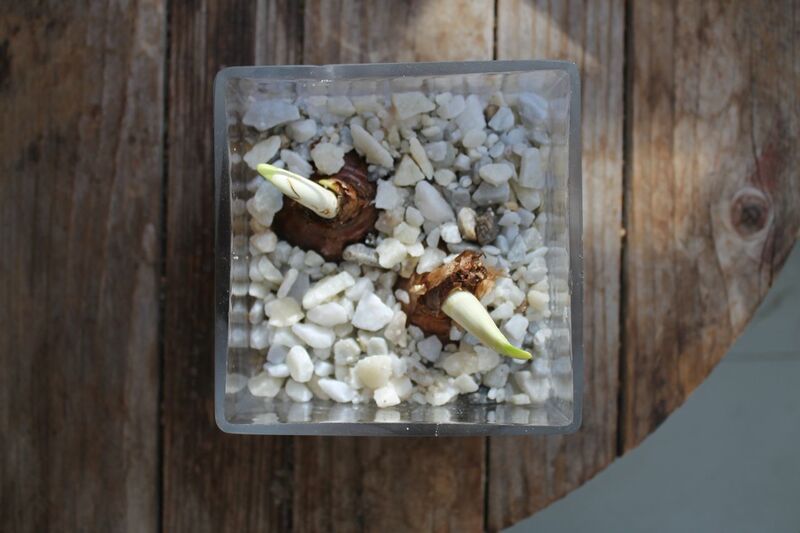 These bulbs also look fabulous planted as a group of 2 or more, in one larger container – just remember to space each bulb and place rocks between each. Looking for an inexpensive, simple, yet lovely gift? 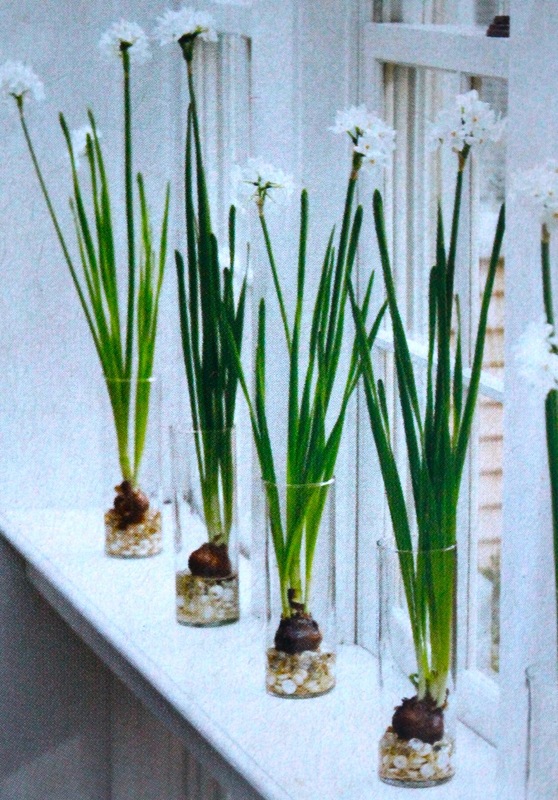 Plant a bulb (or two or more) two weeks prior to gift giving and wrap vase with a bit of red ribbon, the recipient will enjoy loveliness for weeks to come…as will you. 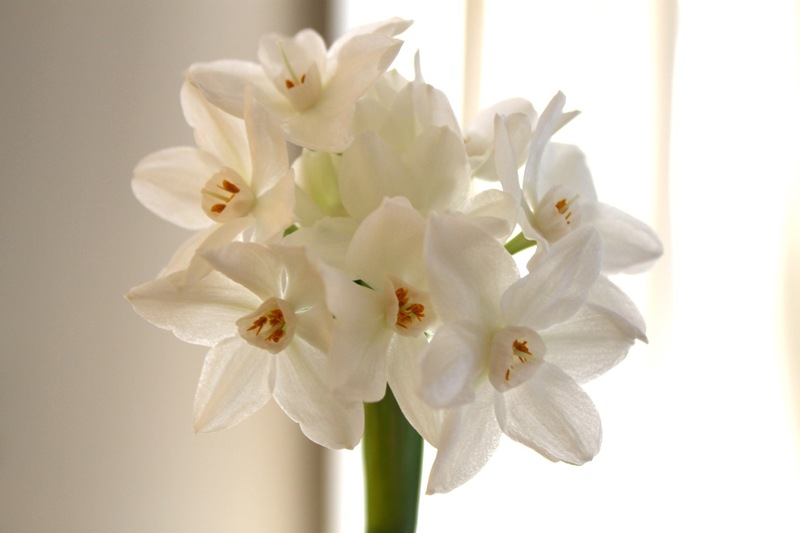 Narcissus planted now, will become divine in December…enjoy. 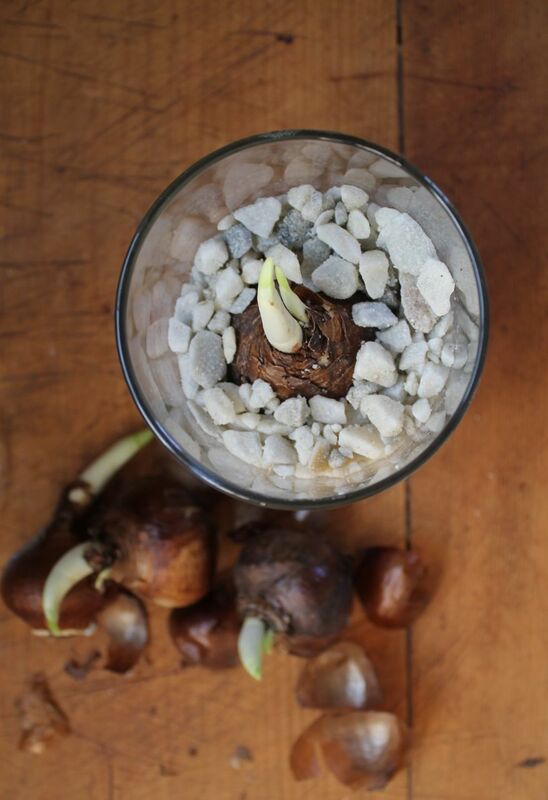 This entry was posted in gardening, nature, photography, simplicity and tagged DIY, flowers, forcing bulbs, how to plant bulbs, narcissus, photography, simplicity by ripe red berries. Bookmark the permalink. These are gorgeous! And now I finally have an idea for how to replace the empty space where my dead as a door knob bouquet of roses was (I kept them for a month and a half!!). ‘Dried flowers’ can be attractive too (: , but live ones are oh so much better…glad I’ve inspired you to get rid of those old roses. Narcissus bulbs can be poisonous to children (if eaten), so do not allow little ones to play with them (just to be safe). They smell divine too! I love dried flowers… until they turn into dried mess on the floor that my dog tries to eat! I’ve been picking the petals as they started coming loose and pressing them in an enormous recipe book! Not sure what I’m going to do with them yet but they were the first flowers I ever received so I can’t bare to just toss them! Sounds like just the thing to do! Perfect idea. Yeah – happy ‘planting’ ! Jen, you are my hero…..I’ve been reading all that you’ve written in the past few months….and I am blown away by your creativity, talent, strength and wisdom…..you are such a rare gift, and I love you! Can’t wait to see you soon. Great step-by-step tutorial, unfortunately due to allergy, I cannot have flowers inside the house. Thank you Norma. At least you can enjoy them outdoors! Thanks so much – Glad to inspire you all the way in Southern India, to bring your flowers inside! They really do look fabulous once they’ve bloomed…all the best – Happy Planting! Great pictures. I might just have to try this although my gardening skills aren’t the best. Thank you! The great thing about this is you really don’t need a green thumb, just keep the water level up to the base of the roots and that’s it (and indirect light). Hoping this project puts your ‘green’ thumb in a better light…good luck and do give it a try. (: Let me know how it turns out. all the best.